The award-winning produce from our thriving food and drink industry is in demand and enjoyed around the world. 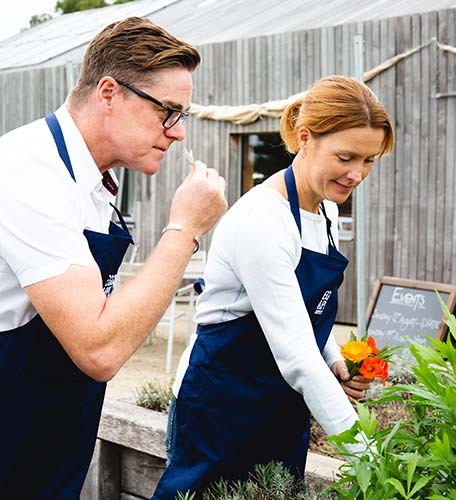 Small artisan producers of high-quality local produce and large-scale wholesale food and drink manufacturers all find the space to grow their businesses in East Sussex. Less than an hour from London by train or car, and with its close proximity to European markets, East Sussex offers a strong supply chain and distribution network, meaning it has the potential to support opportunities for new investment. The last few years have seen an unprecedented interest in our wine industry as well as culinary tourism in East Sussex. With the warmest and driest climate in the UK, varied soils and stunning countryside, East Sussex is not only ideal for growing grapes but also for tasting and enjoying wine. Wine sales, and wine tours, award-winning pubs and restaurants, fantastic farm shops, markets, festivals and craft breweries - are integral components of the county's tourism industry, which generates over £1.4m to the local economy. Our award-winning wine estates have praised the conditions for the 2018 vintage following a summer heatwave and this year's harvest is shaping up to be their biggest and best vintage year ever. The brewing industry is booming too. 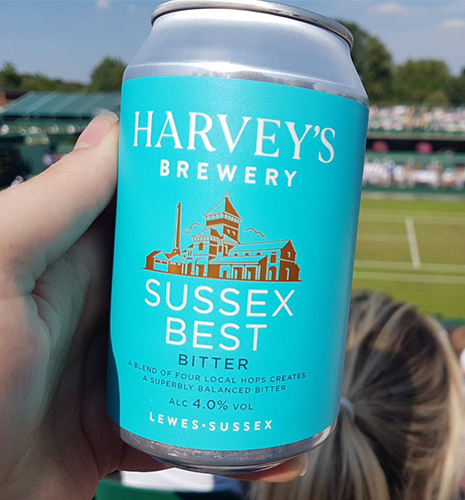 Our oldest brewery, Harveys, brewing in Lewes since 1790, continues to produce award-winning beers, while world-renowned microbrewery, Burning Sky, use natural yeasts and microbes found only in the East Sussex air to ferment its barrel-aged beers. The county is jam-packed with food and drinks festivals offering the very best East Sussex produce, including the ever-popular Hastings Seafood and Wine Festival, Eastbourne's Beer & Cider by the Sea, Rye's Scallops Festival to Wealden's Food & Wine Festival. 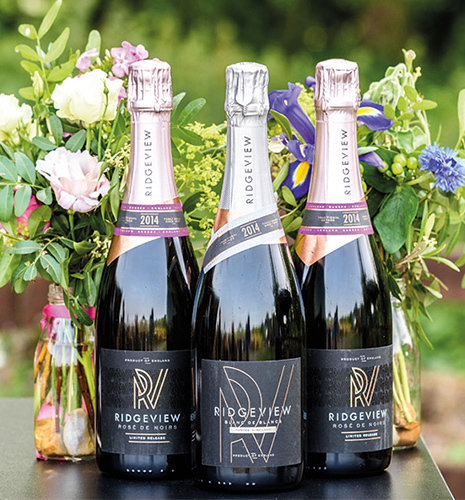 Placing English sparkling wines on the global stage, award-winning Ridgeview paved the way for global recognition of our thriving wine industry. Producer of artisan tonics, juices and mixers that have unique provenance and authenticity. 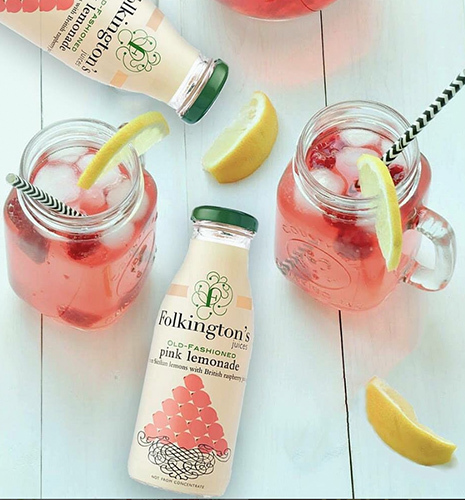 Folkington’s was founded in 2012 by Paul Bendit. 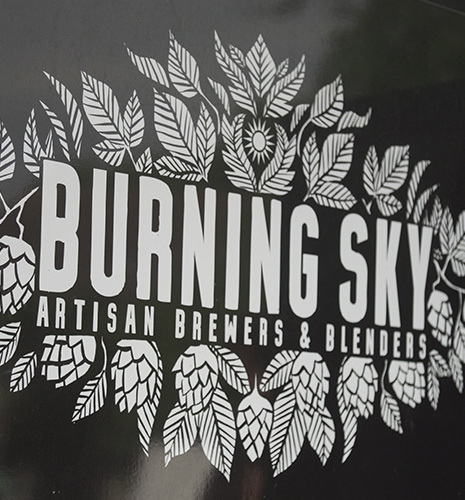 Mark Tranter's Burning Sky voted 4th Best New Brewery in the World 2014 by Ratebeer, and ‘Brewer of the Year 2014’ by The Guild of British Beer Writers. The oldest independent brewery in Sussex. It's pubs and beers can be found throughout the south east. Voted ‘UK Brewer of the Year' by the International Beer Challenge 2017. Established in 2010 by owners Sarah & Mark Driver. RIBA nominated, state-of-the-art winery is capable of producing over one million bottles of Sussex Sparkling wine annually. 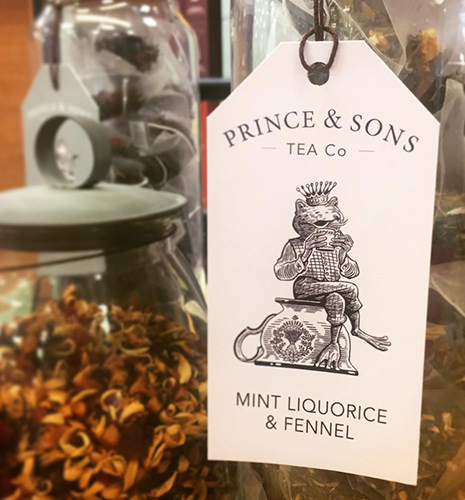 Simon & Kate Prince are making everyday tea exceptional. The finest ingredients from around the world blended into award winning teas and tisanes. 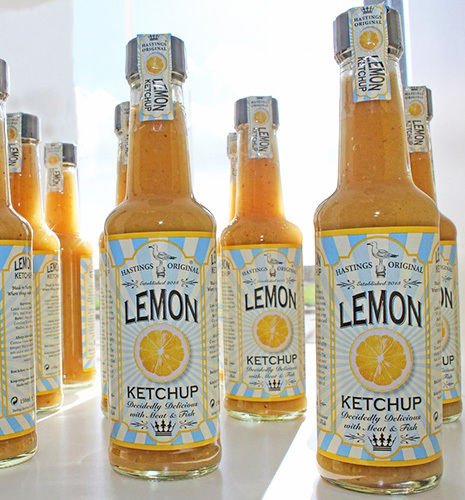 Established in 2013 by Graham Ainsley as a home-based enterprise focused on bringing Hastings Original Lemon Ketchup to homes, restaurants and bars. 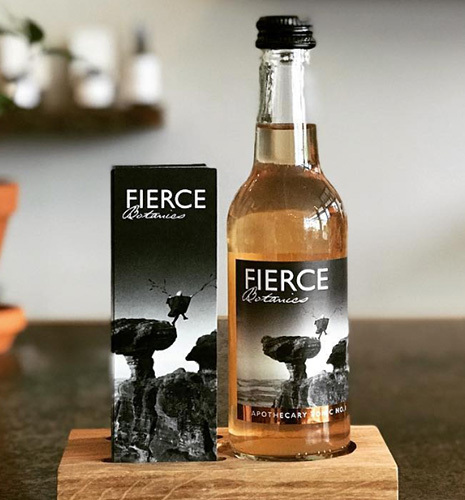 Apothecary tonic water brand founded by Amanda Saurin in 2018. Made with the very best quality organic ingredients and stocked in Harvey Nichols. 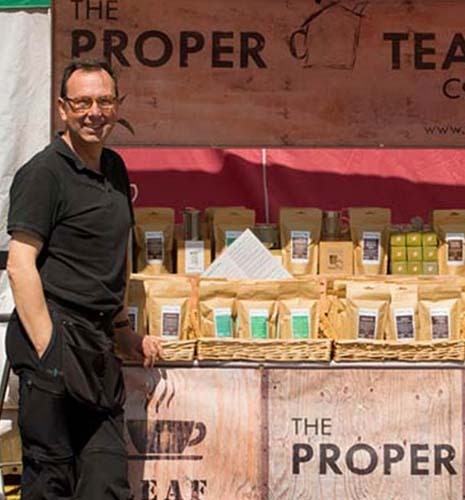 The Proper Tea Company is a small, independent tea merchants formed in 2013 by Peter Wiggins, based in the East Sussex village of Pett, near Hastings. 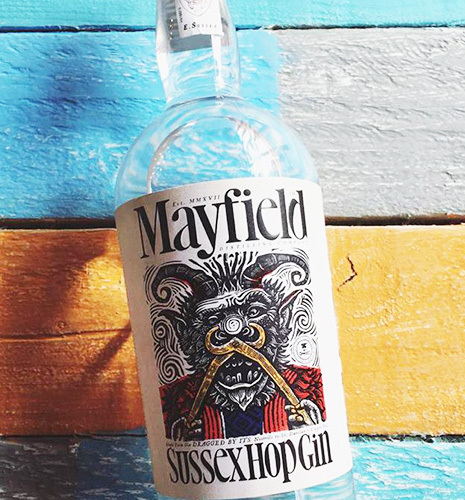 Created by James Rackham, founder of artisanal spirits company, Emporia Brands, liveryman of The Worshipful Company of Distillers and resident of Mayfield. 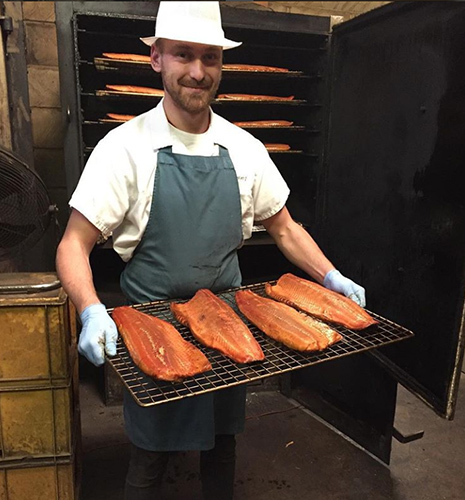 Weald Smokery is among a handful of traditional artisan oak smokers in the UK and provides award-winning hot and cold smoked food to buy online or to order. Award-winning farm shop and café, selling the best, affordable local produce in Sussex and Kent. Founded by Susannah and Craig Hewett. 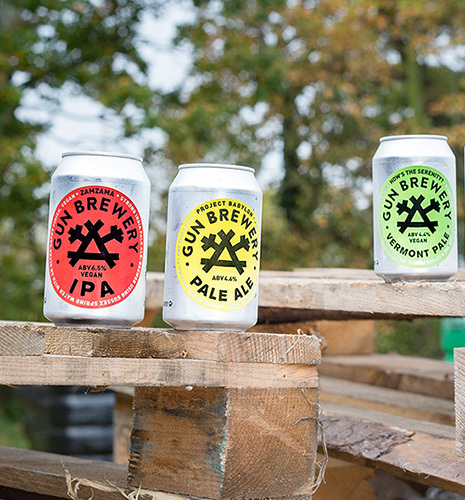 Independent microbrewery produces a range of craft beers into cask, keg and can, using water from a natural spring. Founded by two friends, Toby Smallpiece and Mark Berry. 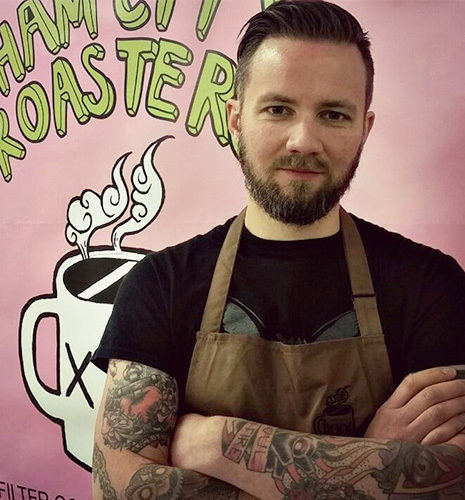 Dave Cullern of Sham City Roasters went from a psychiatric nurse to coffee roaster to owning his own coffee shop and vegan/veggie cafe at The Clockwork Crow. 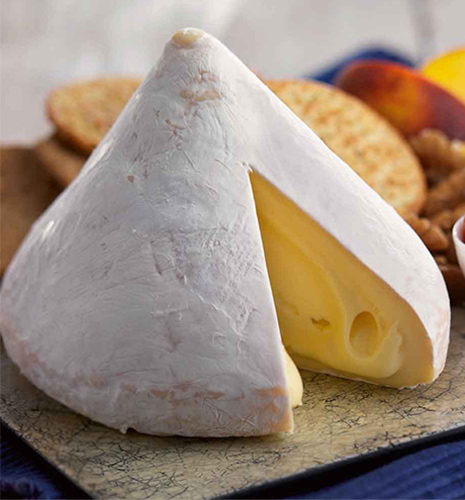 Launched four years ago, self-taught cheesemakers Arthur Alsop and Nicholas Walker's award-winning Lord London cheese, served at the breakfast table at a royal wedding. 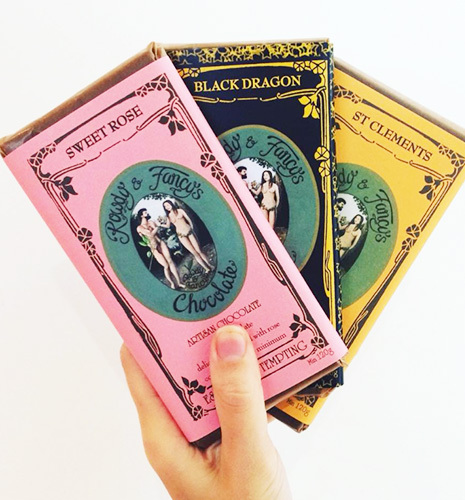 Made by chocolate lovers for chocolate lovers, Rowdy & Fancy's was born out of a desire for a high quality, natural product that looks and tastes delicious. Food manufacturer employs over 100 people with a turnover over £7m. Supplies an extensive range of sauces, dressings, dips and soups to an impressive client list including Nandos. Independent small batch craft beer brewery. 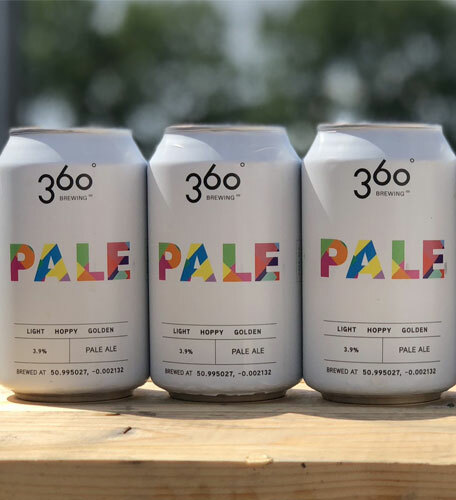 They also have a popular brewery tap where customers get to sample its full range of beers by either enjoying a drink in or taking away in a reusable 'flagon'. 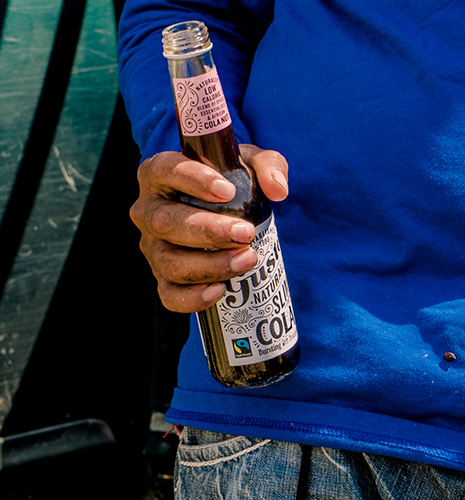 Voted no.1 ethical cola in the UK. 200 UK stockists including the Tate Galleries, the company also exports its drinks to ten countries worldwide. Winners of Britain's Best Loaf 2018 at the British Baker Awards for its white seeded sourdough. 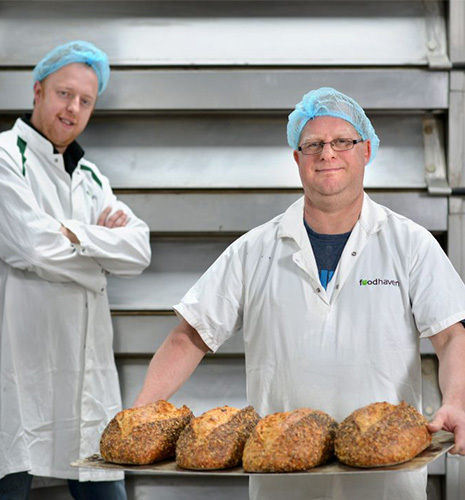 Launched 2015, produces artisan bread for its six Bake Out cafes in Sussex. 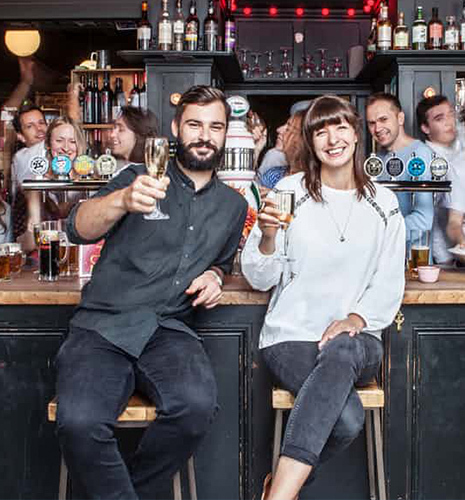 Voted the best place to drink in the UK in 2017. Owners Andrew Swan and Tess Eaton and the team at The Crown, are winners of the Observer Food Monthly award. 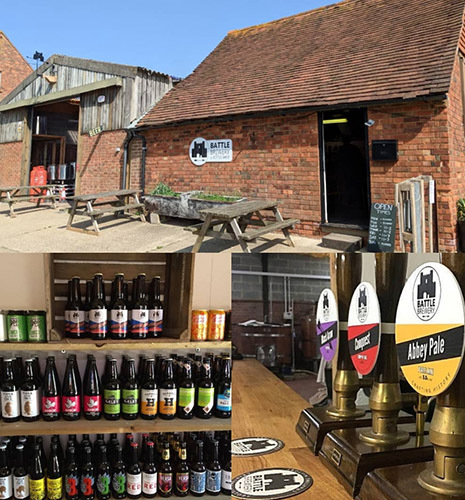 Craft brewery producing beers & real ales in the historic town of Battle, East Sussex. 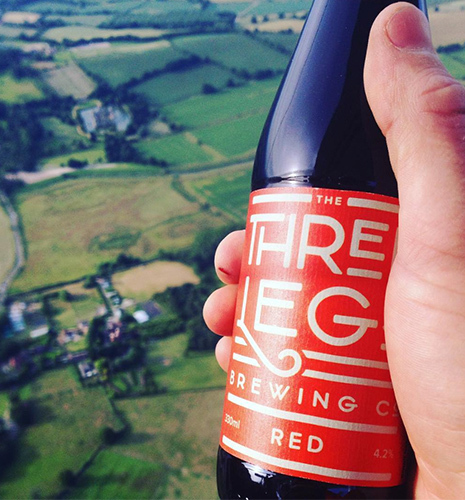 Serving bottled and cask beer to 1066 country and beyond. 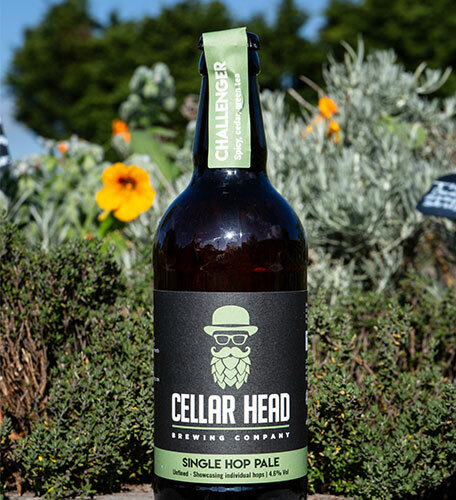 Award-winning microbrewery founded by Chris and Julia McKenzie in 2017. Their traditional brewing methods use native malts and hops and their own strain of historic Sussex live yeast. 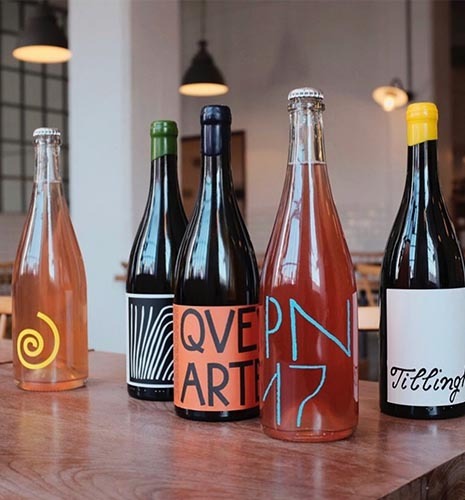 Ben Walgate is creating a buzz in the wine world for his Pet Nat natural wine made using biodynamic farming methods and fermented in a Georgian qvevri. His first vintage sold out in days. 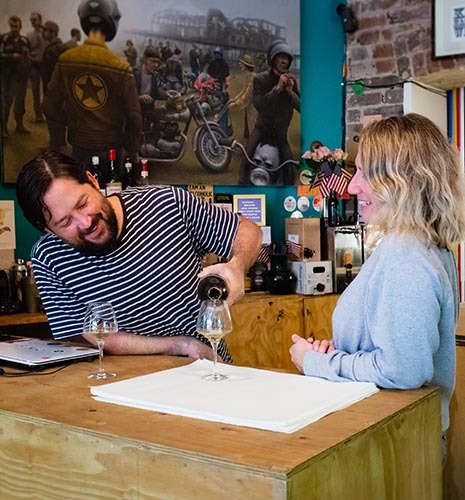 Jess & Michael, proprietors of a very different specialist wine shop in Hastings' America Ground. Feels like a drop-in cultural centre. Sometimes pop-up restaurant, hairdressers, gallery & music venue. 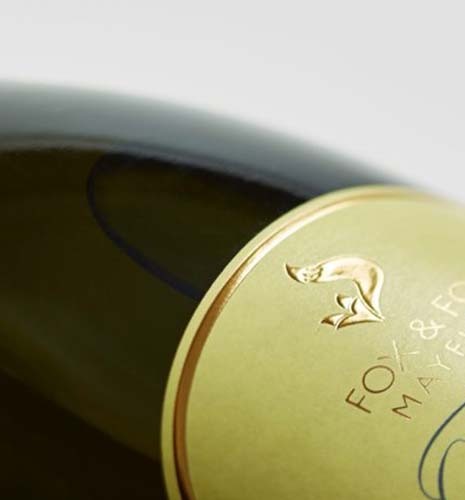 Award-winning boutique grower and producer of English sparkling wines run by husband and wife team, Gerard and Jonica Fox. Set amongst the beautiful area of the Sussex High Weald. 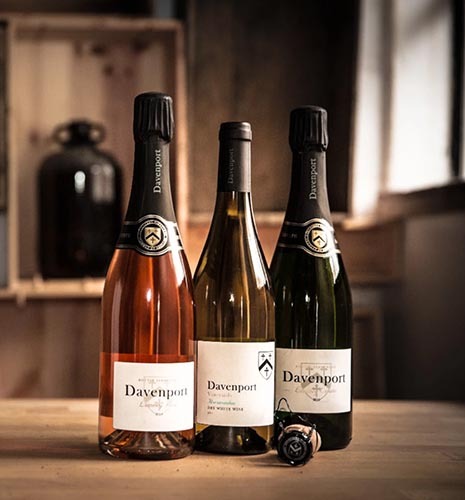 Will Davenport's winery in East Sussex is capable of making 80,000 bottles of wine per year. Will produces natural wines combining traditional techniques with the latest equipment. England's oldest organic wine estate established in 1979 by Roy Cook producing 30,000 bottles of ‘Estate Bottled’ English wine annually. Kristin Syltevik and Paul Dobson's organic farm and vineyards, with over 21 acres of vines planted in 2012 and 2015. 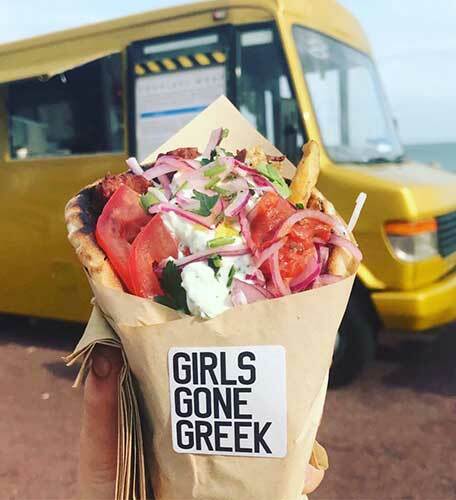 Vegan-friendly with a devotion to quality food, the Girls Gone Greek food truck's mission is to bring British people a slice of Grecian sunshine. Customer focused craft brewery, bringing clarity and winning kudos from consumers with their variety of beers. It is an exciting time for the English wine industry. UK wine sales have reached 40m and set to rise to £1.4bn by 2040, according to a recent trade survey. On a national scale, the South East is the largest wine producing region in the UK. Wine made in Sussex accounts for about a quarter of the total wine produced in England and with over 50 vineyards, Sussex produces more wine than any other county. East Sussex wineries have steadily grown a national and international reputation. Sussex sparkling wine, in particular, has drawn comparisons with Champagne and is regarded as amongst of the best in the world. Wine tourism is booming. Each year, hundreds of thousands of people visit East Sussex in search of wine and culinary adventures and to enjoy everything that East Sussex has to offer. 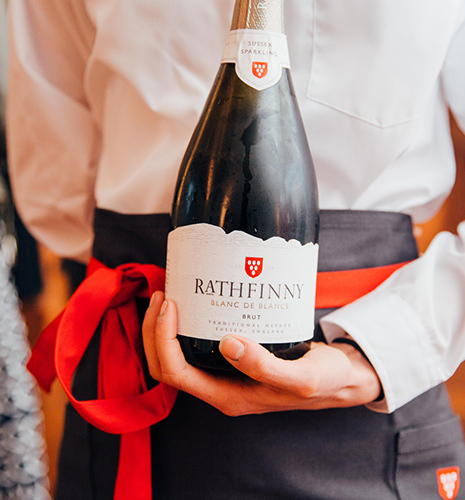 Award-winning wine estates including Oxney Organic and Rathfinny, Bluebell Vineyard and Ridgeview Winery offer visitors unique experiences set in stunning countryside in areas of outstanding natural beauty. There are also many smaller, vineyards and hidden gems to explore where visitors get to taste small-batch vintages often only available in the winery’s tasting room. While there is a big demand for sparkling wines, demand for experimental natural wines is on the rise. 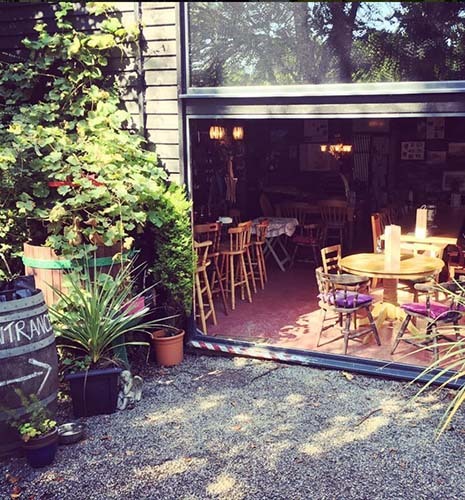 Using organic and biodynamic farming methods, two of the most exciting natural wine producers in the UK are based in East Sussex: Ben Walgate's Tillingham Wines and Will Davenport in Rotherfield, East Sussex. Winemaker Ben Walgate based near Rye uses grapes bought from local growers and leaves as much as possible to nature. 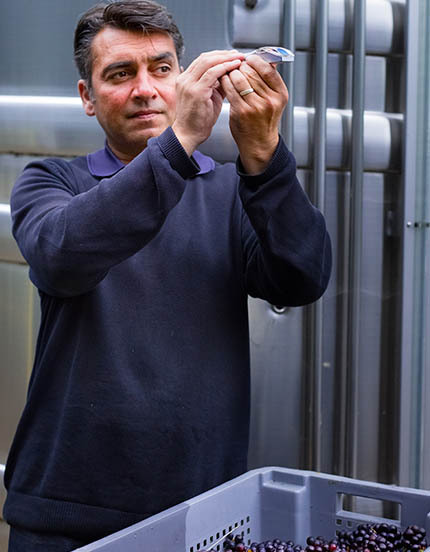 He doesn’t add any yeast to help with fermentation, instead relying on natural yeasts from the grapes to do the job. The first vintage of Tillingham sold out in days. Ben studied at the UK's leading centre of excellence in viticulture, wine research and innovation, Plumpton College, East Sussex. 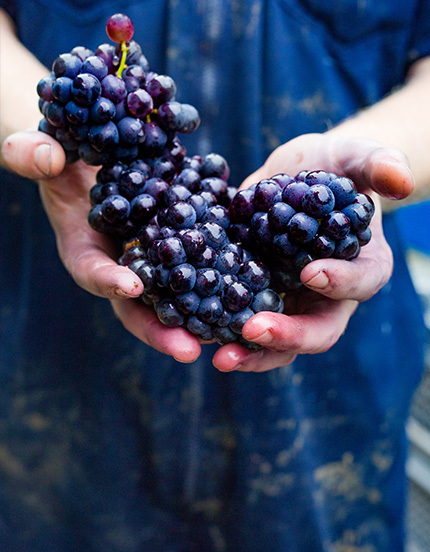 Sussex Wineries is a collaboration of inspiring wine estates responsible for producing some of the most innovative and diverse wine styles in the UK today. 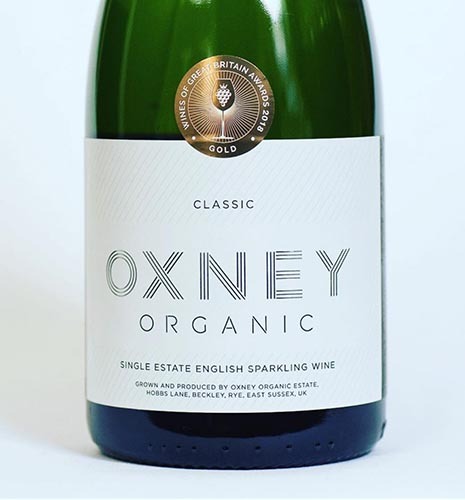 Featuring award-winning East Sussex producers Bluebell Vineyard Estates, Oxney Organic, Rathfinny Estate, Ridgeview, Sussex Wineries promotes the high-quality sparkling and still wines from across the county. Sussex Wineries encourages everyone to discover our wines, cellar doors and tasting rooms, winery cafés, vineyard accommodation, wine tours and experiences. Plumpton College farms over 2500 acres of land and the outstanding estate has grown to become one of the leading centres for land-based education in the UK. Established in 1926, Plumpton has developed and built a curriculum and business support framework across the south-east, with now over 3500 students and 2500 businesses across its four centres (Plumpton, Stanmer, Netherfield and Flimwell). The College has an excellent reputation for delivering vocational skills training and education for the land-based sector and rurally located businesses. It works with employers and businesses to develop programmes to ensure new entrants develop the right skills, knowledge and attributes to enhance the performance of their business. With the rate of the population growth increasing all of the time, it is vital that we find ways to produce food in adequate quantities and sustainably. Plumpton has an excellent range of courses that inspire and give students the necessary skills and knowledge they need to succeed. Whilst agriculture is a flagship curriculum and the most specialist of its kind across the south-east, Plumpton is renowned for being the UK’s centre for excellence in wine; providing vital access to first-class education, training and research. Students benefit from excellent links with wine producers and distilleries, including visits to the world’s key marketplaces in wine which help kick-start careers in this competitive industry. Plumpton College also provides industry training for vineyards and wineries through its WineSkills extension programme. If you're passionate about food, Plumpton has excellent facilities at all of its centres. Whether you are already in the industry or hoping to master a new skill Plumpton has a range of food skills courses to suit. Food industry students have access to an onsite Dairy Processing Unit where they pasteurise milk and produce various cheeses, yogurts and ice cream, and butchery students have a fantastic off-site butchery school in Robertsbridge. East Sussex has a rich fishing heritage. Our close-knit fishing communities possess the skills and knowledge in the ways of the sea acquired over many generations. Small boats land fish daily from the shallow, high-salinity waters of the East Sussex shoreline, rich in minerals washed down from the Wealden soil, ensuring the freshest fish and seafood of the highest quality is available within hours of being caught. Commercial fishing fleets operate along the entire coastline in East Sussex with the main fishing fleets of Eastbourne, Hastings, Newhaven and Rye. Fishing activity is mostly undertaken by beach boats setting nets from the low water mark out to 6 miles offshore. This style of fishing is known as ‘low-impact’ as it has a very little effect on the seabed or marine habitat. Most local boats land daily and catch are sold to the public via fish stalls or taken to Rye, Hastings or Brighton markets. The fishing fleets rely on seasonal fisheries native to the area and catch fish depending on what quota is available. The fleets work closely with local authorities to enable consumers and the community to benefit from sustainably caught fish and shellfish. Campaigns such as Hastings Fish helps to support a 1,000-year-old fishing industry and promote local, sustainable species to the public. There are lots of pubs and restaurants serving up fresh fish and seafood dishes around the county, if you’re a seafood lover you’ll love what East Sussex has to offer. Whether you are a grower, manufacturer, co-operative, retailer or caterer, we can help you at each stage of your growth journey. If you are starting up or trading, or thinking about restructuring or passing on your family business, we can help you to grow your food and drink enterprise. Many businesses in this sector operate from one or more premises. Whether factories, offices, retail units or mixed-use our commercial property, we can help find the right space. There are different needs between mass market producers and small specialist producers. Large producers face ongoing demand from supermarkets and their customers to provide high volumes of high quality, low-cost produce. These producers have to utilise science and technological methods and skills to reduce waste, develop energy efficient production systems, and minimise the use of pesticides. Ethical consumerism is generating market opportunities for specialist producers, but this will necessitate effective leadership and management skills to implement and maximise these avenues. We can help businesses to access cutting-edge academic research partnerships, and a skills pipeline as this sector is likely to become more focused on science and technology due to the pressures of climate change, environmental regulation, food security and demographics, as precision agriculture and sustainable intensification is implemented. Knowledge of the sciences and application of ICT, mainly technical and engineering skills, are therefore likely to be key future demands. If you're a food and drink business in East Sussex looking for funding contact us to check eligibility and chat through available options.